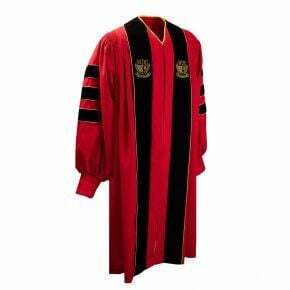 Our doctorate deluxe gown is one of our high end robes which is perfect for your faculty members and PHD graduates. The finish is a muted satin so it's not as glossy as our shiny gowns but not matte either. 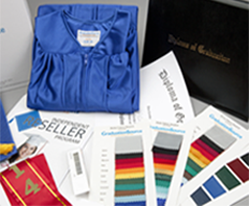 Made with a higher quality polyester, our deluxe doctoral gowns have several notable features. These robes include black velvet chevrons down the center and on both arms with gold piping. 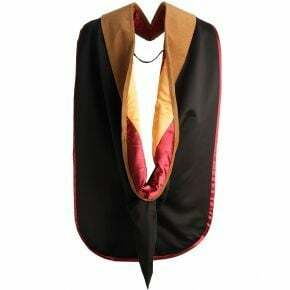 They also include a padded yoke and fabric covered button on the back of the gown for hood attachment. All of our doctorate gowns have adjustable velcro lantern sleeves for a fitted, distinguished look. Our doctorate deluxe gown is an excellent alternative to renting and is designed to help you outfit even a large graduating class without going over budget. These gowns are affordable enough for a one-time use but durable enough to be reused several times. 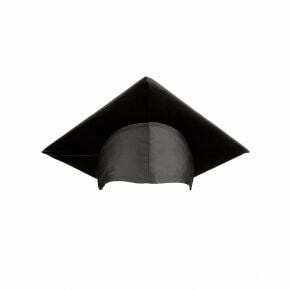 Our deluxe doctorate gown is only available in black. 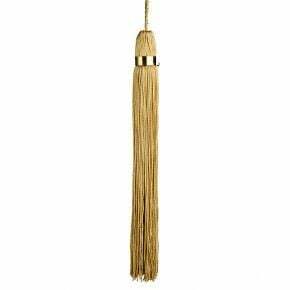 If you do not want gold piping, we also offer our deluxe doctoral gown with black piping.